Green Bay Packers WR Davante Adams: “It was a terrible no-call. I mean, I like to stay away from the refs as much as possible, but that’s unacceptable. And they need to see the guy on the replay after kind of telling them after, it kind of looked like one of the guys wanted to throw a flag and they were waving him off to not throw the flag. To see that, it kind of brings up all the conspiracy theories and all of that stuff. Like I said, I stay away from that. 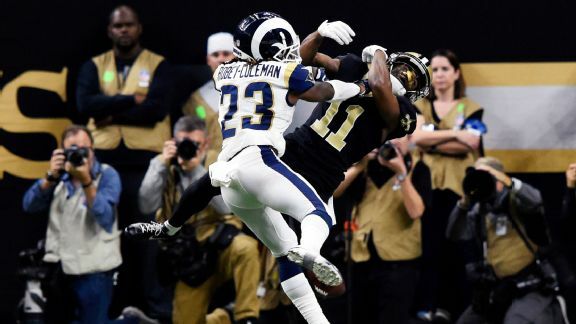 But things like that, it’s tough, because it puts you in a position where now the ref is taking control of the game and usually you want to say that that doesn’t make a difference or you can’t blame it on one call, but in the NFC Championship Game, that can make or break your chances of going to the Super Bowl. It’s tough, but we’ll see what the league does about it. “It doesn’t really matter. Because at the end of the day, they’re not reviewing offensive plays,” Wagner continued. “All of the rule changes are going to be toward the defense, so we have to adjust. It is what it is. Dallas Cowboys WR Amari Cooper: “It was a really good game, man. Really competitive game. But the no-call … Aww, man. … You have to make that call. And I don’t know, it’s pretty weird, because if you watch a lot of football, you know on every pass interference call the ref can go out there and throw the flag late. Like if he’s indecisive about whether it’s a pass interference at first, he can throw it a couple seconds late. And that was a blatant, obvious pass interference and helmet-to-helmet, so I don’t understand why he didn’t go out and say [it]. I did see like a replay where the referee wanted to throw the flag but the head referee or the other referee was telling him not to throw it, so it was pretty weird. San Francisco 49ers coach Kyle Shanahan: “I thought the same thing as everyone else. It was obviously pass interference. But they missed it. That happens a lot. You get used to it as a coach. You just have to deal with it. Oakland Raiders coach Jon Gruden: “I talked to Sean Payton yesterday. It’s a disappointing way to lose a game, but I don’t know what the ramifications of that are going to be. We all saw it. We all know there will be some action taken, I’m sure.